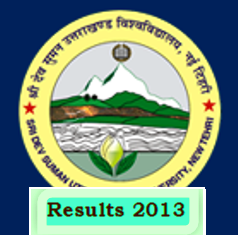 Sridev Suman University B.Ed Entrance Examination Results 2014 | SDSUV:-Now everyone is familiar with the Sridev Suman University, because it is newly University of the Uttarakhand and providing various private courses examinations from last one year. So now the Sridev Suman University has announced or declared the result of B.Ed (Bachelor of Education) Examination 2014. The B.Ed Entrance Examination 2014 of Sridev Suman University was held earlier and now the University declares its results.